Final draft script 23rd August 1974, shooting script 28th August. Filmed 9 September- 23 September 1974. SFX filmed 25 September- 7 October 1974. 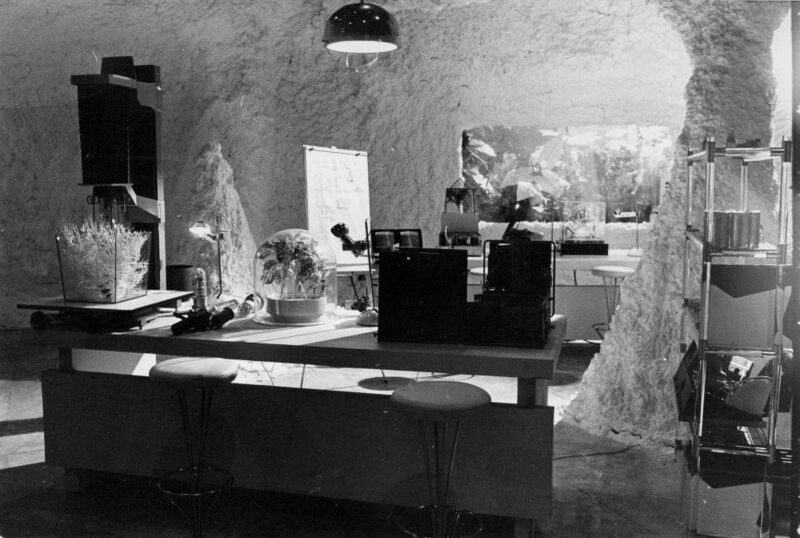 The briefly seen Phoenix was built by Martin Bower and was inspired by the partially constructed rocket in When Worlds Collide (1951). The "this episode" clip includes a view that does not appear in the episode. 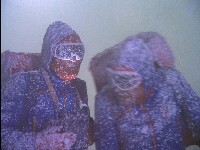 The blizzards were created with a spray gun. Unfortunately it gave off fumes and stripped the skin from Martin Landau's face. Keith Wilson: I built the set out of rubbish, literally. I went around the lot at Pinewood, collecting all sorts of bits and pieces. We compiled these shapes, and then we covered them with foam, to lose all the roughness and give it nice icy shapes. They used formaldehyde to create the snow, but it did leave an odour. It was a 'bleach' smell or something like it, and it made your nostrils tingle. The set was huge, it covered the whole stage. We were due to shoot on it on the Monday and we were dressing it over the weekend. The set was finished with all the snow on it and when Gerry brought Martin and Barbara in to show them, it made their eyes water, This immediately caused a panic: 'We're shooting on this on Monday. What are we gong to do?" It was ridiculous, because once you got used to it, you couldn't smell it any more and it wasn't harmful to you in any way. There were men working on the set, sitting there eating prawn sandwiches in their break, saying, 'What smell?" They had scientists and all sorts of people doing tests, and of course at the end of the day they all said it was unpleasant but totally harmless. Nobody expected such an overreaction, but it did cause quite a stir. A special vacuum pump was installed to clear the air after every shot, but it was still asphyxiating. The public health inspector was called and determined the fumes were uncongenial but safe. 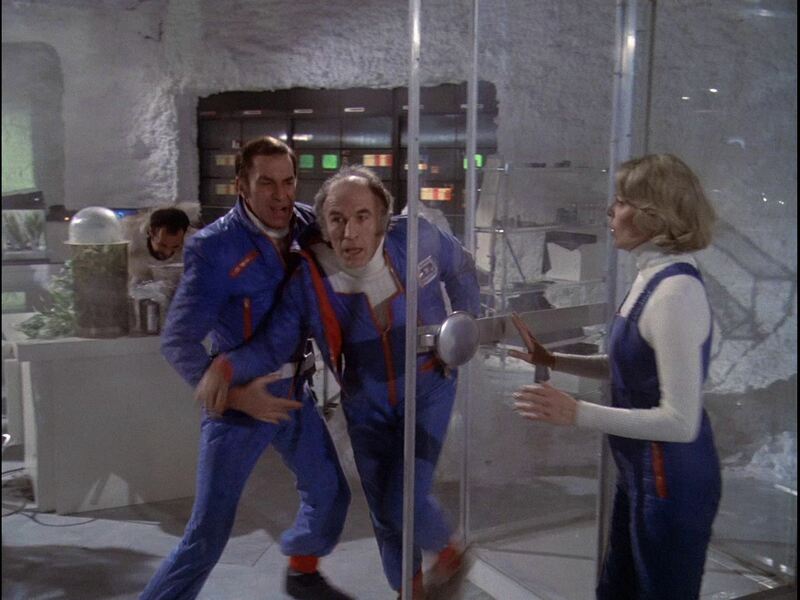 Landau and Bain were still worried, so Gerry Anderson called in an eminent Harley Street doctor. He sniffed and said it was alright. He then enjoyed a drink with Gerry, but by the time he met the Landaus he was the worse for wear. Unimpressed, the Landaus got their own expert to say the doctor's level was unacceptable. It took much persuasion to complete the episode. Meanwhile one day a group of riggers were found in the middle of the set eating their prawn sandwiches. "What smell?" they asked. In Roman archives, Thule is an island 6 days sail from Britain, considered the most northerly part of the world. It may refer to Norway, Iceland or the Shetland Isles. The poet Virgil used the term "Ultima Thule" in the poem Georgics (29 BC), meaning the end of the world. The term was used in medieval literature for a remote island in the frozen north. A 30-km diameter irregularly shaped object in the Kuiper belt (beyond Neptune) designated (486958) 2014 MU69 was named "Ultima Thule" in 2018. The New Horizons probe will pass it in January 2019. The Alphans refer to smog. Smog is pollution (named from smoke and fog)- it is caused by smoky fires (from burning forests or houses and cars). It seems unlikely there are any large fires on the ice planet. The Alphans have passed through time warps (Another Time, Another Place) so it is not surprising it is 2870. Interstellar strength communications are referred to. 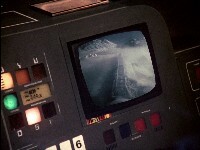 The technology is also used in Space Brain and Collision Course. There was a manned mission to the planet Uranus in 1986. At this time, Moonbase Alpha existed. The X5 computer panels seen on Ultima Thule show that Moonbase Alpha's computer is at least 13 years old. Only use of the Alphan ski-suits (that aren't used when it gets cold in Black Sun or Testament Of Arkadia). Note that Helena's Alpha insignia is on the right chest, but on the left chest for male suits. 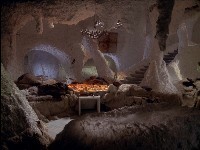 The lights in the ice cave are also seen in the Croton ship in Dorzak. 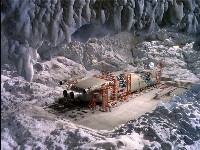 Alan in the command module brings up a shot of the half buried Eagle. How did the camera get over the Eagle? The title is from Romans 6; Christ is raised from the dead, "death hath no more dominion over him". 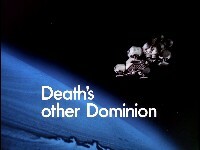 See also the 1914 Dylan Thomas poem "And Death shall have no dominion". Rowland believes that death has no dominion over them ("We shall be as gods in the Universe!"). Smile boys, that's the style." Lucifer is a brand name for a match, fag is British slang for a cigarette (Alan's words are almost drowned by the wind at this point, perhaps because the latter is American slang for something quite different). Strangely, in the middle of this line, Alan declares himself to be in the second stanza. Thanks to Isobel Hoy. The plot is very similar to Lost Horizon , a classic 1937 movie by Frank Capra. It would have been well known during the writing and filming of this episode due to the spectacular flop of a musical version in 1973 starring Peter Finch. A British diplomat crash lands in the snows of the Himalayas, and finds an isolated valley, Shangri-La. In this paradise, the people live for hundreds of years in a utopian society. The diplomat eventually leaves but his journey is perilous in a fierce snowstorm. A girl who is escaping with him ages rapidly and dies an old woman. While Ultima Thule is not the warm utopian valley of Shangri-La, the crash, snow storm and ageing are elements that seem to have been borrowed. "A set of life-on-the-moon videos I picked up at the library. 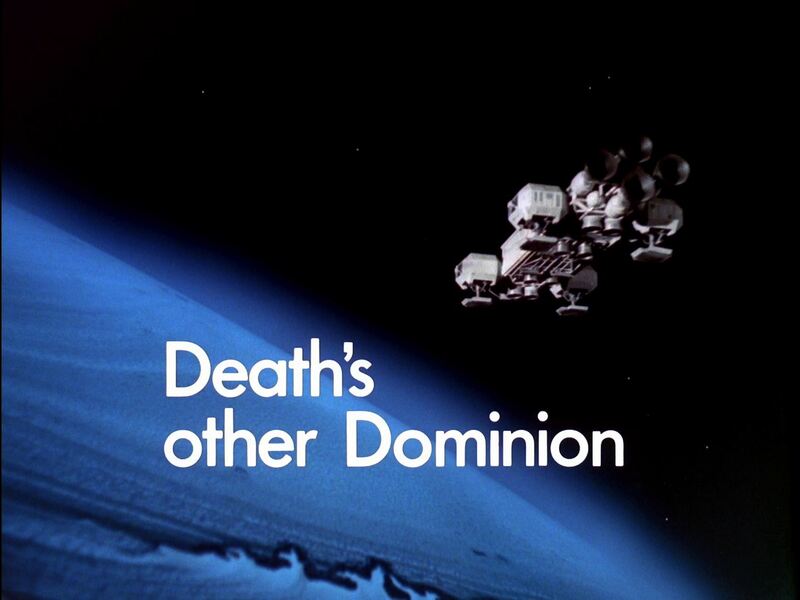 "I'm not sure if they're nasa-sanctioned or not, but they look pretty informative"
"I assume the date is a typo"
(reads) "Episode 5: Death's Other Dominion"
"I like how they don't sugar-coat things." Novelised in La Grande Dominatrice by Gianni Padoan (AMZ). Power records did an audio version (with new actors and sound effects) for their LP "Hear Three Exciting Stories"